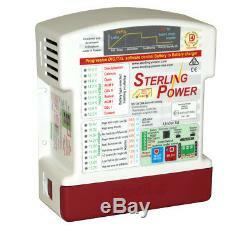 Sterling Power ProBatt 12V 30A High Power Battery to Battery Charger. High power battery to battery charger. Ideal for commercial/leisure vehicles and marine applications. Easily installed with no complicated wiring. 3 stage battery charging program. Default mode complements regenerative braking and does not require ignition feed. Additional modes with ignition feed and timer options. 9 preset battery chemistry options plus custom profile settings. IP 21 drop proof design (non waterproof). 100% fireproof plastic casing with multi-stage fan cooling. Measures 190 x 160 x70. For technical assistance on marine power, please call our expert sales team free on 0800 310 2100. All orders are despatched form our Enfield warehouse, which stocks over 2,000 product lines. If you simply change your mind, you can return and item to us within 7 days of receipt - please remember than in such cases you are liable for the return carriage costs. Please remember we are only human and that occasionally things might go wrong; if so we will do our best to rectify matters as soon as possible and rest assured we will learn from our mistakes. The item "Sterling Power Pro Batt Ultra 12V 30A Battery to Battery Charger ProBatt BB1230" is in sale since Wednesday, March 9, 2016. This item is in the category "Vehicle Parts & Accessories\Boats Parts & Accessories\Accessories".